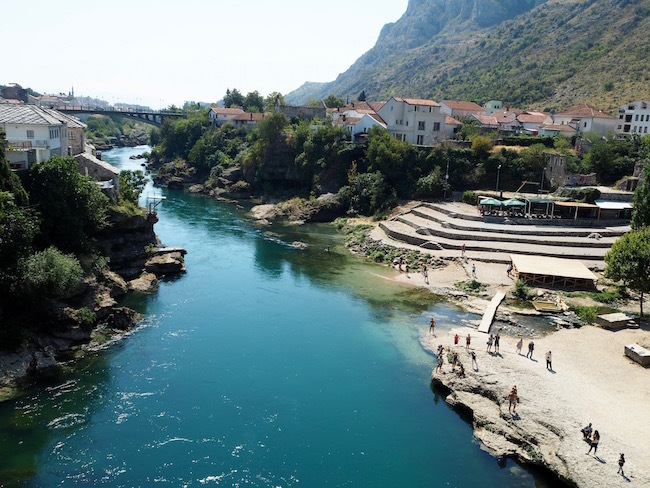 A popular day tour from Dubrovnik is a trip into nearby Bosnia and Herzegovina to visit the city of Mostar. 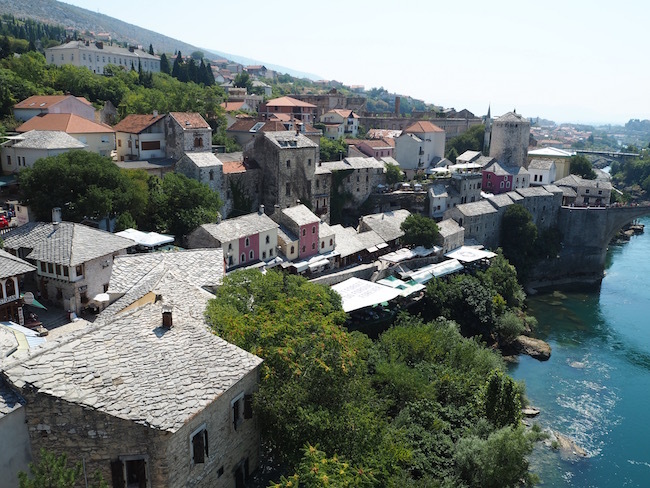 Mostar is located in the south of Bosnia and is the fifth largest city in the country. 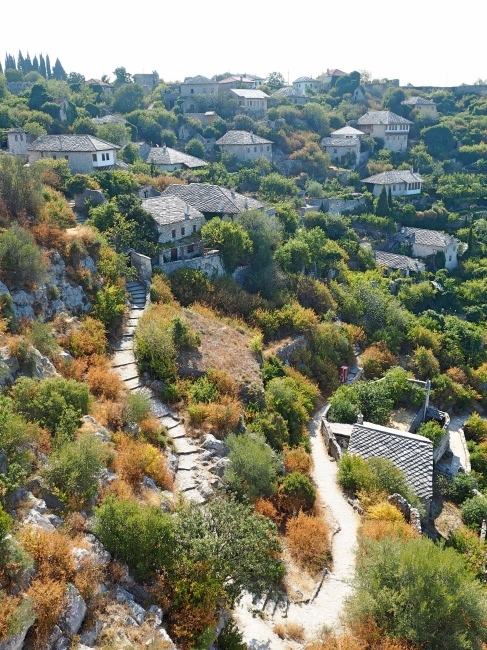 Only two hours drive from Dubrovnik, it is relatively easy to get to. You can either hire a car or take one of many private or group organised tours. 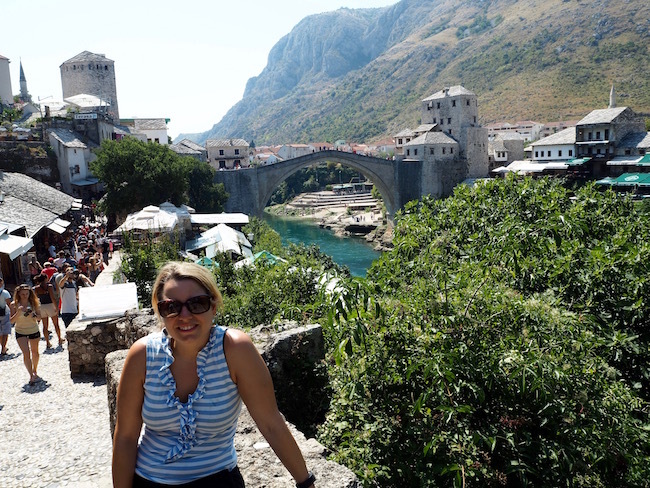 As we had always wanted to see Stari Most, Mostar’s famous bridge, we took a private tour with Cheap Dubrovnik Tours so that we could have more flexibility. After a beautiful scenic drive up the Adriatic coast, we arrived at the Croatian border. Going through customs between the borders was easy; they barely checked our passports! We didn’t know much about Bosnia so during the drive our guide gave us a bit of history about Bosnia and the war that took place between 1992 and 1995. Our first stop was Pocitelj. 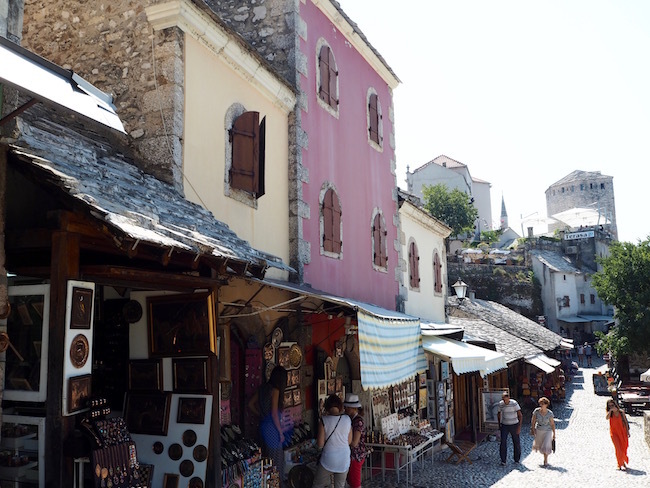 This old Islamic village is about an hour from the Croatian border on the way to Mostar. 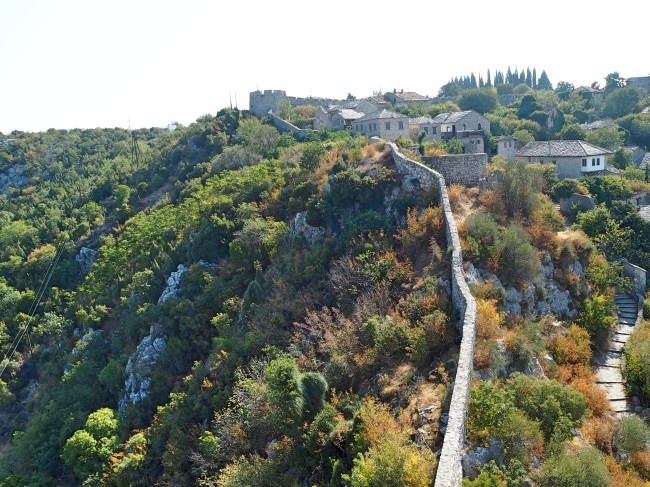 Set on the left bank of the Neretva river this fortified village was built by King Stjepan Tvrtko I in 1383. 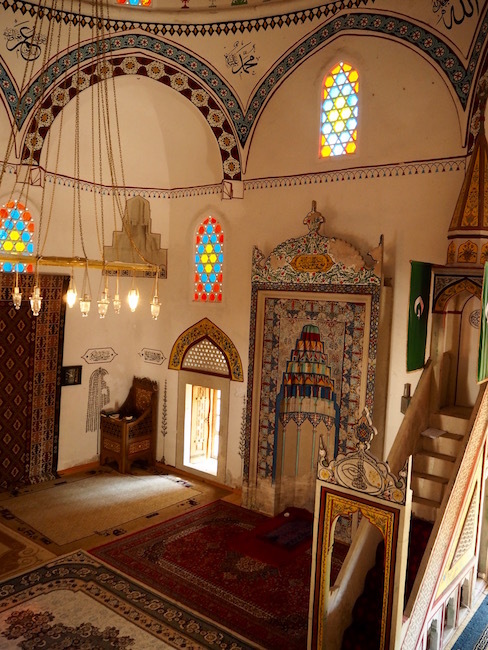 The town evolved between the 16th and 18th century and shows both medieval and Ottoman architecture. 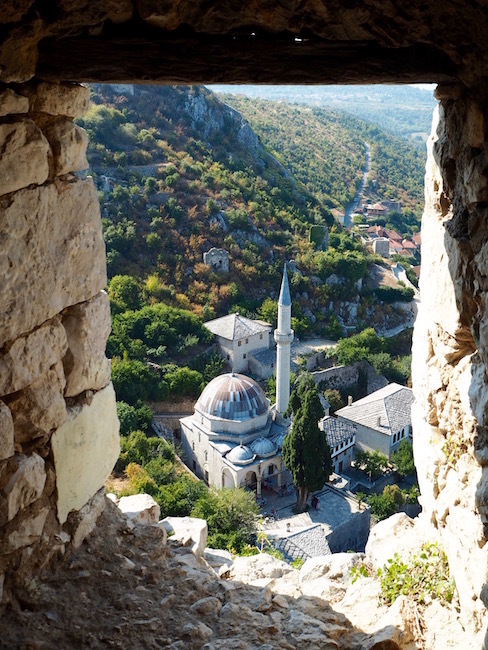 The two main attractions to see in Pocitelj are its fort and its mosque. 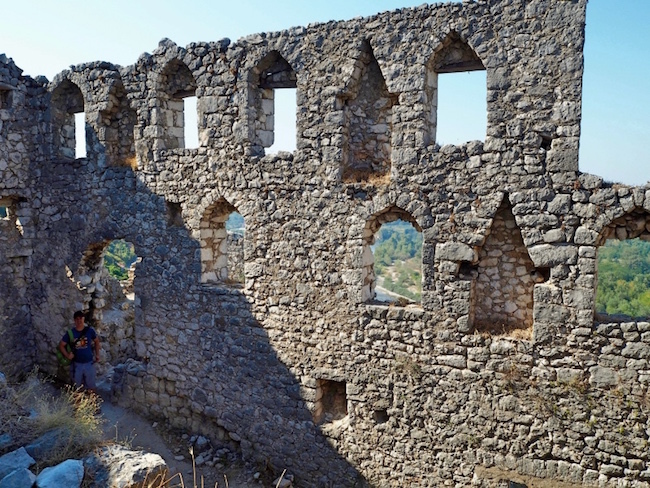 Sadly Pocitelj was heavily damaged during the war and the effects of the war are still visible today. We hiked the steep cobbled streets all of the way up to the top of the fort. This walk took us around fifteen to twenty minutes which was a little tiring in the heat. However, it was totally worth it! 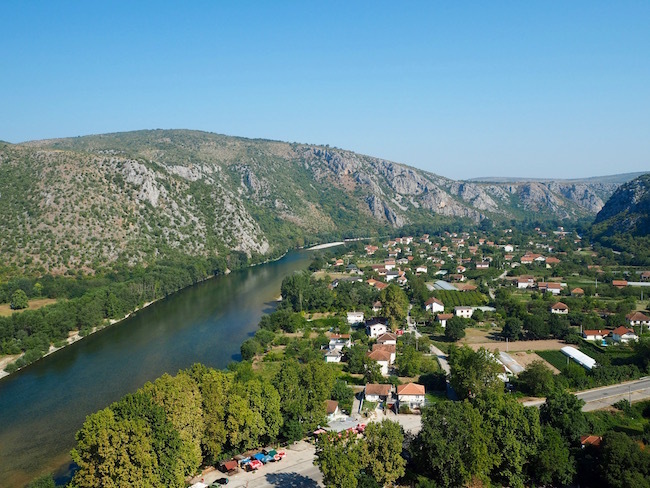 The views over the Neretva river made up for all of that effort. The fort itself is not maintained so be careful when walking through it. Climb up to the top of the tower for an even better view and a great photo opportunity! Another great view from the fort! For one euro fifty, you can visit the mosque. 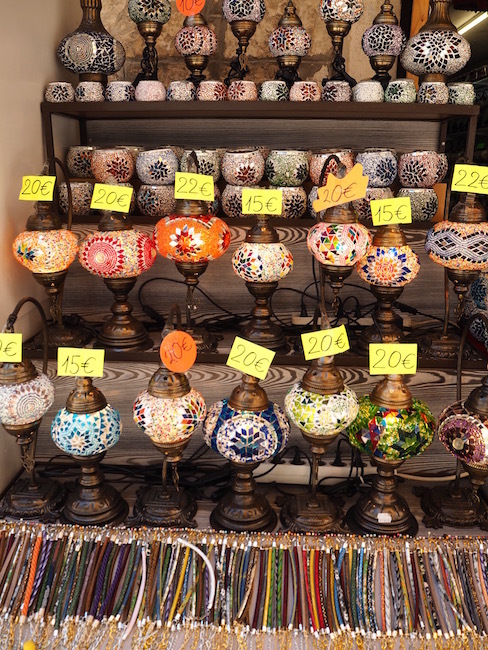 Outside the mosque on the old cobble-stoned street, there are many ladies selling souvenirs and fruits. They will approach you but they are not pushy. Also compared to Croatia, Bosnia just seemed so cheap! If you love coffee and you need a good dose of caffeine, try a Bosnian coffee in one of the small cafes at the bottom of the old town. It will certainly do the trick! 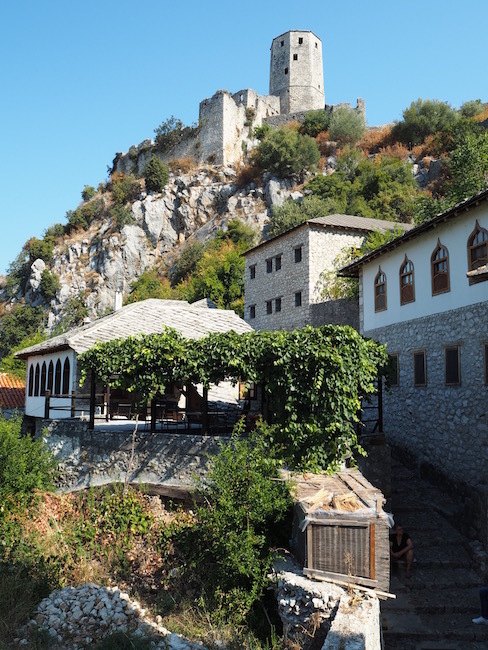 After spending an hour in Pocitelj we made our way to Mostar. Mostar was also badly damaged during the war and driving through the city, we saw many remnants of the war including a number of ruined or abandoned buildings, and many walls still with visible bullet holes. Our tour guide also explained to us about the ongoing conflict between the local Catholics and Muslims. 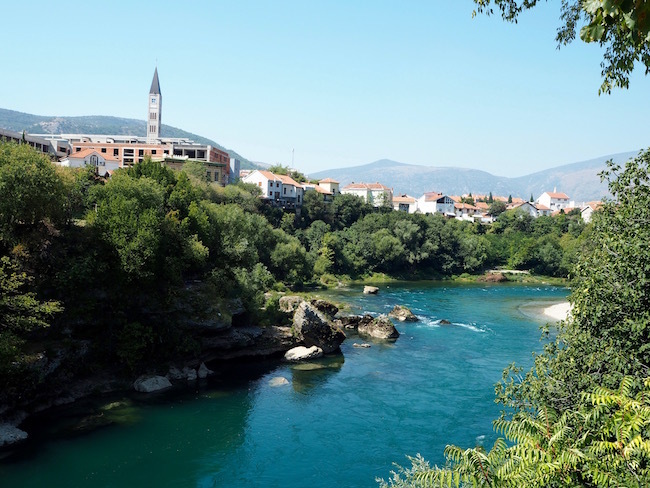 Because of the fighting between them during the war in the 90s, Mostar is now a divided city. One half is Catholic only; the other half is occupied only by Muslims. The division is so strong that residents of the two halves never intermingle, either professionally or socially. People who in many cases prior to the war were friends or co-workers are now enemies. In fact, the town has had to bring in an administrator from the European Union in order to run the local council. Due to the ongoing tensions, they have been unable to elect a council themselves for several years. It was quite sad to hear about this and it looks like it will take a long time to break down the barriers built up by the war. We started our walking tour at the start of Onescukova Ulica. 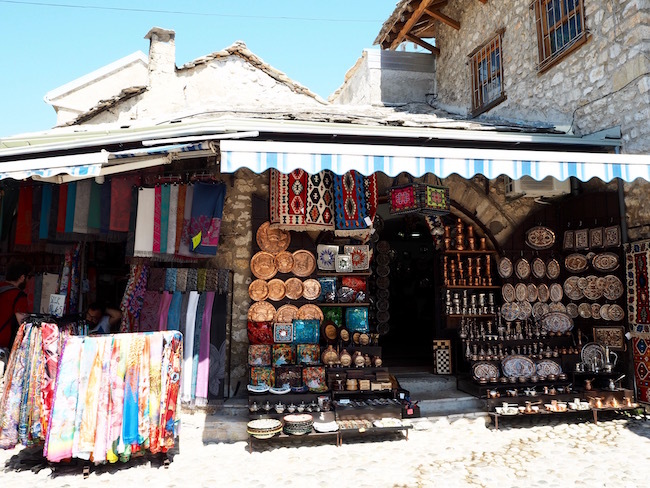 After walking down this street lined with Turkish style houses and with shops filled with cheap souvenirs and colourful items for sale, we reached the famous Stari Most, the Old Bridge. This beautiful and famous bridge has a sad history. After surviving for hundreds of years, it was destroyed during the civil war in 1993. Its destruction was a deliberate ploy to demoralise the city’s inhabitants. Fortunately, the bridge has been rebuilt to its former glory using the same construction techniques and is again impressive to see. It is also now a UNESCO World Heritage site. The road leading to the bridge is paved with cobblestones and the bridge itself is smooth stone with some ridges on it for grip. Even with those ridges, it is quite slippery and many people seemed rather nervous crossing it. I would imagine it would be even worse on a rainy day! 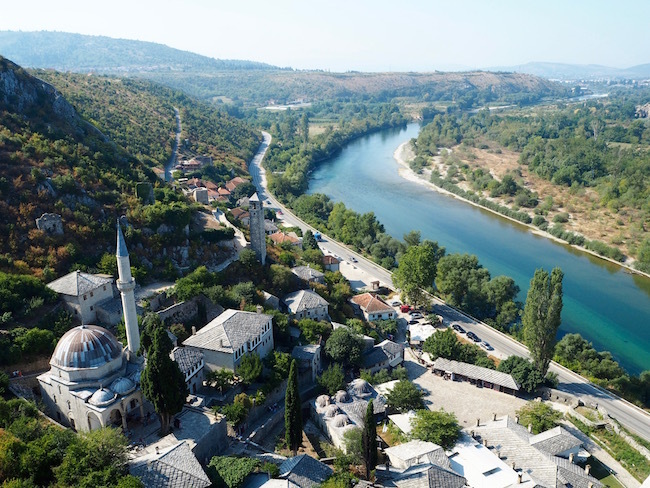 From the bridge, you get splendid views over the Neretva river and the Koski Mehmed Paša Mosque. 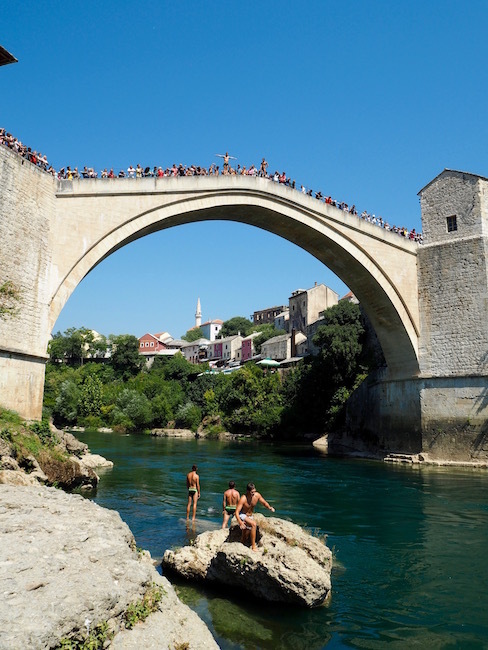 If you’re very lucky, one sight you might see in Mostar is young local men jumping off the old bridge, with a crowd applauding their efforts. Jumping off the bridge is a tradition which began in 1664. I reckon it’s a bit of a crazy tradition; it is extremely dangerous and many people have been injured or killed while jumping. Local men in bathers hang around the bridge collecting money. As we arrived our guide told us that these are not the men that will jump. The actual jumpers only appear closer to the jump time, and even then they will stand perched on the outside of the railings pretending to prepare to leap. Only once they have raised at least twenty-five euros will they please the crowd by jumping from the bridge and plunging the twenty-four metres into the water below. But frankly, who can blame them. The jump is very dangerous and Mostar is a very poor city. However, all of the waiting around does mean that there will only be two or three jumps per day; you will need to be a little bit lucky to catch one. Non-locals can also pay to jump from the bridge (and receive a certificate for doing so). While we were there we were very lucky to see seven New Zealanders jumping one after the other. It was very thrilling for us to watch but not something we would want to try. We told our guide about the New Zealanders when we met up with him afterwards. He mentioned that just a couple of weeks prior a Bosnian man had died in front of the crowds and his wife and children when the wind flipped him horizontal and he broke his back and drowned on entry. I wonder if they would have still jumped had they known that! The old bridge separates the Catholic side of town from the Islamic side, both literally and culturally. Once you cross the bridge there is a very unique and distinct Ottoman style atmosphere on the other side. After enjoying the views from the bridge we paid a visit to Mostar’s beautiful mosque. 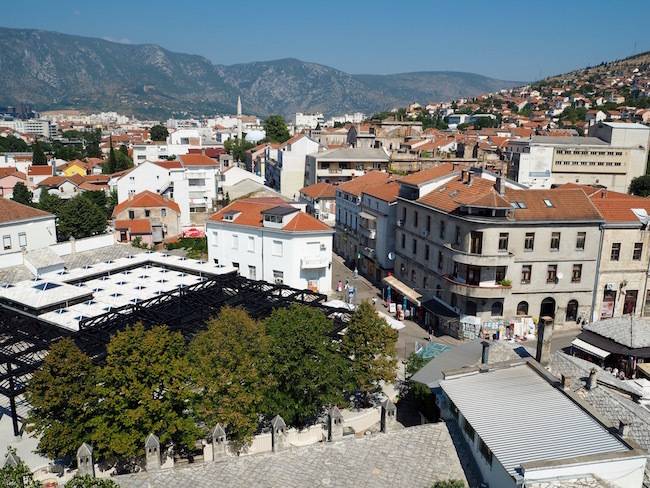 From its grounds, the Koski Mehmed Paša Mosque offers beautiful views of the old bridge. 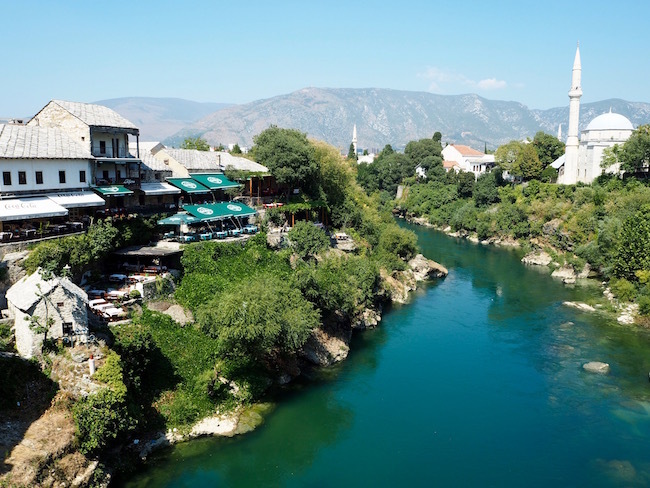 For six euros you can go inside the mosque and climb the minaret for bird-eyed views of Mostar, the old bridge and the beautiful turquoise Neretva river down below. 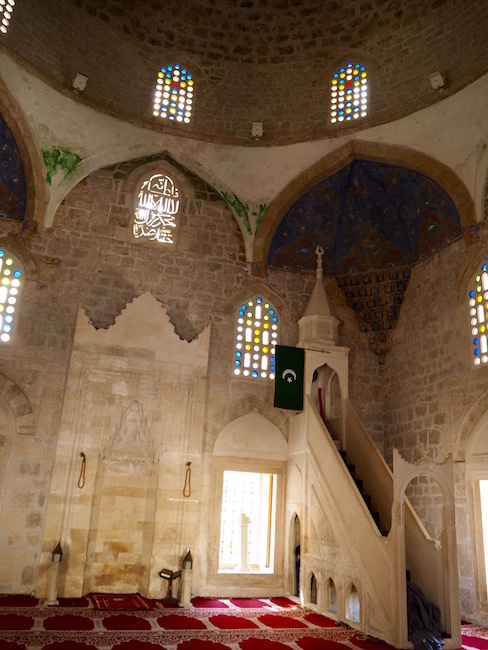 The spiral stairway in the minaret is not for the claustrophobic; it is very narrow and has barely any windows. It doesn’t take long to get to the top however and the views are well worth it. 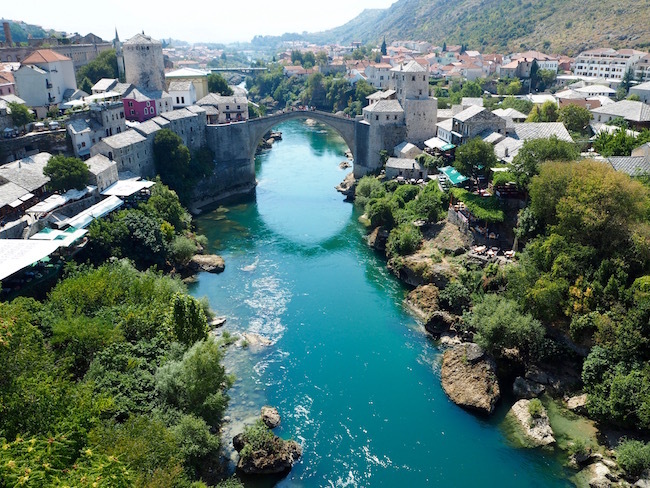 If you want to find out more about the history of the Stari Most and Mostar, check out the Old Bridge Museum right on the other side of the bridge. They have footage of the original bridge during the war including the exact moment when a mortar shell finally destroyed it. Posing in front of the bridge! After three hours in the heat of Mostar, it was time for a refreshing swim. 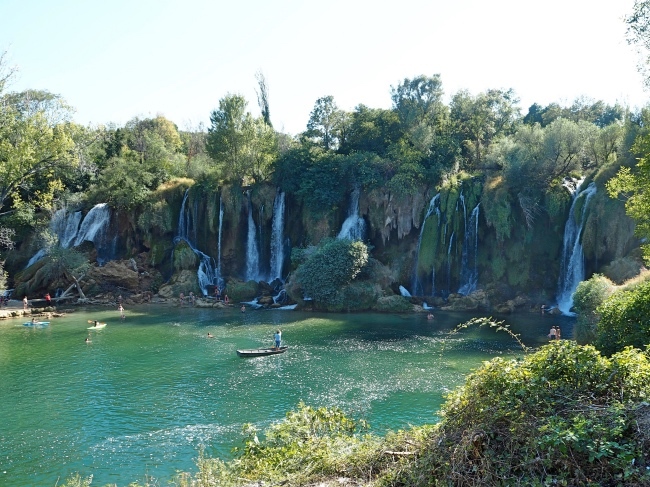 So on our way back to Croatia we made a final stop at the Kravice waterfalls. Those beautiful waterfalls are worth the small entrance fee (which you can pay in Euros, Marks or Kunas). They are only a very easy five-minute walk down the hill from the carpark. Of course, the walk back up is a little more tiring but not too difficult. It was the middle of summer so the waterfalls were not flowing as much as they could have been but they were still stunning. There was a very nice cool breeze that eased the heat of the summer. While there you can go for a swim so be sure to take your swimsuit with you! The water is very cold but refreshing. You can also rent a small boat with a driver to do a tour around the waterfalls. There are a couple of cafes near the falls where you can have a coffee, cold beer or a snack while enjoying these beautiful waterfalls. It was very crowded while we were there which made it quite difficult to take good pictures. However, it was nonetheless a great place to stop. We could easily have spent all day relaxing in those waterfalls had we had more time. We enjoyed our day in Bosnia and we enjoyed learning about its interesting history. It is clear that economically Bosnia is struggling much more than Croatia. Tourism is, therefore, a vital part of their economy. We hope to return to Bosnia for a much longer trip in the future. We have heard that there are many other lovely places to visit. 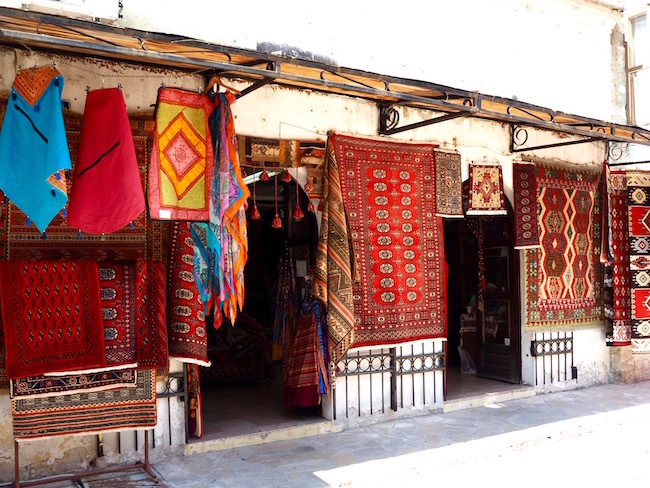 In particular, Sarajevo is high up on our list. 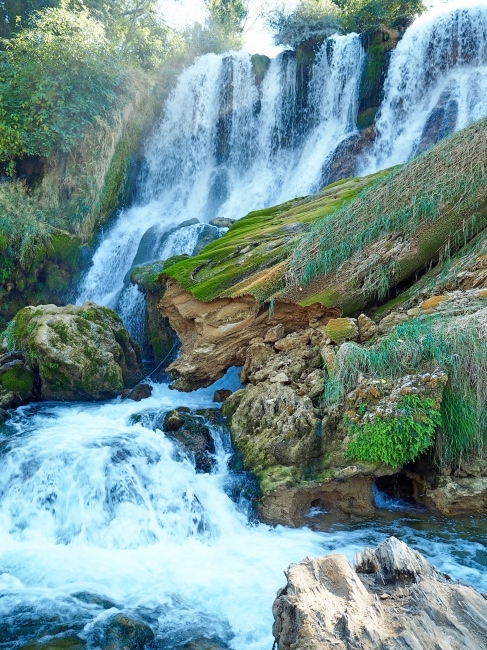 If you have been to Bosnia and know of any other sights to see there, don’t forget to comment below and let us know. Mostar looks stunning; we’d love to visit. Your pics of the countryside are beautiful!